Sure, there’s a movie sequel out now called Independence Day: Resurgence. Of course, it’s missing a lot of weird over-the-top charm that made the first movie fun. Thankfully, there’s a better option out there. Independence Day UK has actual BBC broadcasters playing themselves. Well, themselves as they would be if there was a giant alien invasion. So the first half of the play is “UFO Watch,” with actual British presenters Nicky Campbell and Mark Goodier. Oh, and the astronomer Patrick Moore, who had the very strange task of trying to introduce anything remotely scientific into an Independence Day property. • Continue reading at io9. 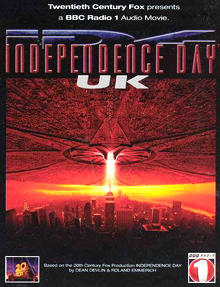 Further info on Independence Day UK at toyahwillcox.com.